The scenario in the book includes a premise (the imperial seal which is in the hands of Princess Ju, travelling incognito, will be “borrowed” and counterfeited by a master forger), suggestions of ways to entangle the player characters and possible consequences, and the stats for the two main non-player characters (the princess and the forger). While I liked this beginning a lot, I needed a backdrop that would incite to action as well as additional story hooks, because I had to drive all this to have lots of action and some sort of resolution in a four-hour time frame with a group of relative strangers at the table. Hence, adding the secret treaty negotiated under cover of the Moon Festival. Although there is no mention of the Moon Festival in Tianxia, it seemed like a natural fit; I also decided that Băo Jiāng’s version would be rowdier and more pagan than anywhere else, with dedications to the old gods and especially Grandmother Moon. There would have to be various competitions, especially a martial arts competition! Thus, I filled in the outline for five segments, some of which could be combined or skipped. I thought I would open with a classic scene, a busy inn on the eve of a holiday. I read up on real-life traditions for the Autumn Moon Festival and I particularly liked the game of riddles written on lanterns and played at night; I thought it would be a perfect place to have a rooftop chase in the dark and for cryptic messages to be exchanged and intercepted. 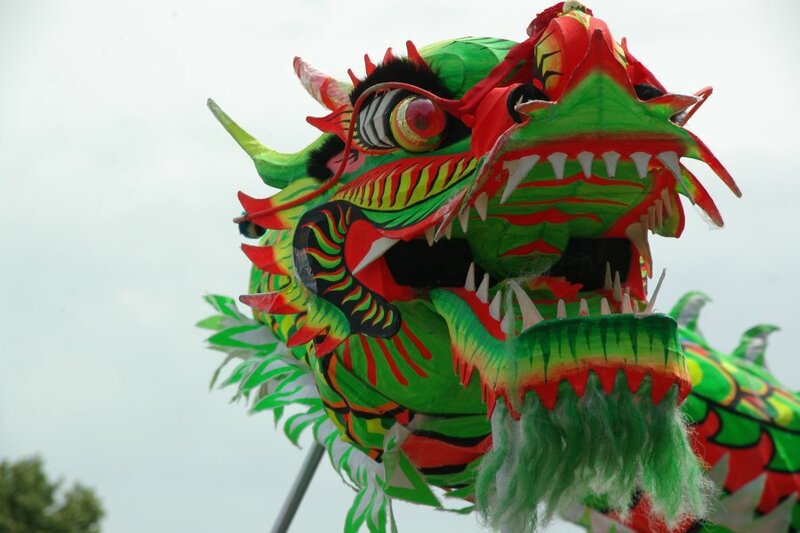 The final set piece would of course be the parade, because a dragon dance is just so visually exciting. For my NPCs I chose a number of characters provided in the book so I had no new stats to create. I decided I would use the six example characters provided in the book because they are interesting and well designed to illustrate some classic wuxia character concepts. I compiled a list of riddles to use on the lanterns, then I added a list of Chinese names I could use for NPCs, a table sign, and printed character pictures which I would place in little table stands so we’d know who was who at the table. My game notes are here if you want to download them. As usual, I had listed the game for four players in the convention program, but was ready to accept up to two more players. This is my way of (1) saving a spot for my husband when he’s available, and (2) helping find a game for players who were not able to sign up for a game ahead of time. As it was, Edmund joined us but we had no additional walk-in players so we ended up with five heroes: Detective Dishi, Smiling Ox, Han Ping, Sister Chuntao, and Wolf-Eyed Yue. The players were at least somewhat familiar with both the Fate system and the wuxia genre. I spent a little time talking about the Fate Core actions, especially Create an Advantage for the players more familiar with Spirit of the Century. I then went over the setting-specific rules, particularly Chi, Jianghu rank, and of course wuxia forms, styles, and techniques. Ping’s player had brought a couple of copies of the beautiful Deck of Fate from Evil Hat Productions, while I had not dared risk mine. He lent me the red-backed deck to use, as it was so perfect for Tianxia. I ended up using it instead of my dice, and drawing from the aspects written on each card to interpret the results. In addition, whenever someone rolled a +4 (we had no -4 rolls, though we had some -3 rolls), I gave them an “arcana” card to use as inspiration for a free boost at a time of their choice. We opened the story with the crowded Drunken Dragon Inn on the even of the Autumn Moon Festival. Detective Dishi’s player was eager to start earning fate points and self-compelled to run into trouble with ruffians in the alley behind the inn. Han Ping’s player announced that she was running heedlessly towards the inn, late for dinner. Wolf-Eye Yue was crouching on the rooftop to get a little fresh air and quiet. Smiling Ox was in the common room, devouring food like a remorseless eating machine, with Sister Chuntao demurely keeping him company. Detective Dishi observed ruffians exchanging money for a wrapped package; when they spotted him, their leader ordered: “Leave no witnesses!” As Dishi was confronting the thugs threatening him, using his authority, Ping emerged from around the corner and ran full-tilt into him, sending him sprawling. A scuffle between heroes and bandits ensued; Yue, observing this, jumped in to help her companions. Soon, Smiling Ox and Sister Chuntao came out to check what the noise was about. This was our first fight, to let everyone get familiar with the rules. Naturally, the opponents were mostly mooks except for their leader, and ultimately not much of a threat. Then Wolf-Eyed Yue’s player (in point of fact, my husband) spent a fate point to declare that the leader was marked with a tattoo of the White Widow sect. That was not in the script! I was not sure how I would weave that in, but I nodded and carried on. Said leader was defeated, and either killed or knocked unconscious (I can’t remember for sure), and soon the surviving bandits ran away. The heroes gave pursuit but lost the trail. They examined the bodies left behind and I decided that the White Widow tattoo had been expanded with additional marking indicating a renegade faction. They decided to investigate, and one neat thing that happened is that Smiling Ox and Han Ping started partnering, making a delightful compare-and-contrast pair. So Ox and Ping chatted with patrons of the inn, Dishi used his investigative skills, Sister Chuntao used her underworld contacts, and Yue reached out to the White Widows. Then I was struck with the idea of using the Brainstorming rules from the Atomic Robo RPG, which I mentioned in my previous post. Atomic Robo in my Tianxia? It was too good to pass up. The way the rules work is that all the players who decide to participate decide how they are investigating (i.e., which skill each is using) and take turns describing their action, Then everyone makes an Overcome roll, and the one with the highest success creates a fact (a situation aspect) related to his or her action. We do this twice more with progressively increasing difficulty; if three facts are successfully established, we have one more round of rolling to determine who gets to formulate a hypothesis linking all the facts; otherwise, we place a mystery aspect on the situation. Naturally, at that point I knew that my plot was out like the dodo. However, I firmly believe that the scenario is what you use if nothing better comes along during the game, and my players were wonderfully creative so I felt it was worth a shot. Well, that turned out to be a great decision. Using the Brainstorming rules meant that everyone’s investigations mattered, rather than becoming an exercise in pixel-hunting for the right answers. The players were good at reincorporating each other’s ideas and coming up with a consensus.In addition, this allowed us to run pretty quickly, montage-style, through the connecting part of the episode to get to the big finale with enough time on our hands. We ended up with a plot involving the White Widows, who were actually there to protect the Moon Princess by winning the kung fu tournament and becoming the Moon Champion, and a splinter sect that used poisoned tattoos to corrupt the Chi and subvert their victims, planning to do this to the Moon Champion and cause her to assassinate the Moon Princess, framing the White Widow sect. The players also identified a rich merchant, Uncle Wei, as a suspect. Meanwhile, Smiling Ox and Ping got themselves knocked out, only to wake up later chained up in a leaking boat that was slowly sinking. They were wrapped up back-to-back with the chain of Ox’s Demon Hammer, making it impossible for him to break his chains without risking harm to Ping. But of course Ping managed to wiggle out and the two were free… and wet… in the slowly sinking boat. A swift run, jumping from boat to boat, led them to Uncle Wei’s warehouse. After a quick fight with a masked adversary who managed to escape, Ox and Ping found indications that they were too late: the tattoo kit had been used. Even worse, there had been enough for two victims! (All this produced by self-compels.) They needed to warn their companions that the champion had been corrupted, so they managed to insinuate themselves in the dragon contraption. 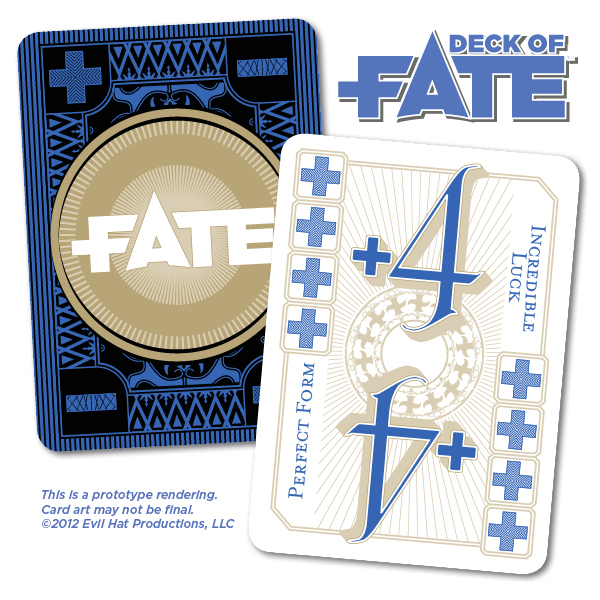 It was very cool that for their investigation and infiltration, they used the arcana cards they had received for rolling +4 earlier, giving an atypical Careful boost to Ping and equally atypical Sneaky to Ox, both cards from the Fate Accelerated arcana. We decided this represented the characters learning and growing. But the villains had more than one subverted White Widow killer! Another was poised to kill the Governor, and thugs were mixed in with the crowd. Ox and Ping then did a phenomenal wuxia leap as the dragon, making it look like the dragon was coming to the aid of the Moon Princess and Governor. Detective Dishi seized the moment, using all the authority he could muster to order the troops to strike at the traitors. (We did rush a bit through the end of the fight, I would have liked to have 15 more minutes.) And of course, we had an epilogue with everyone back at the inn and eating. 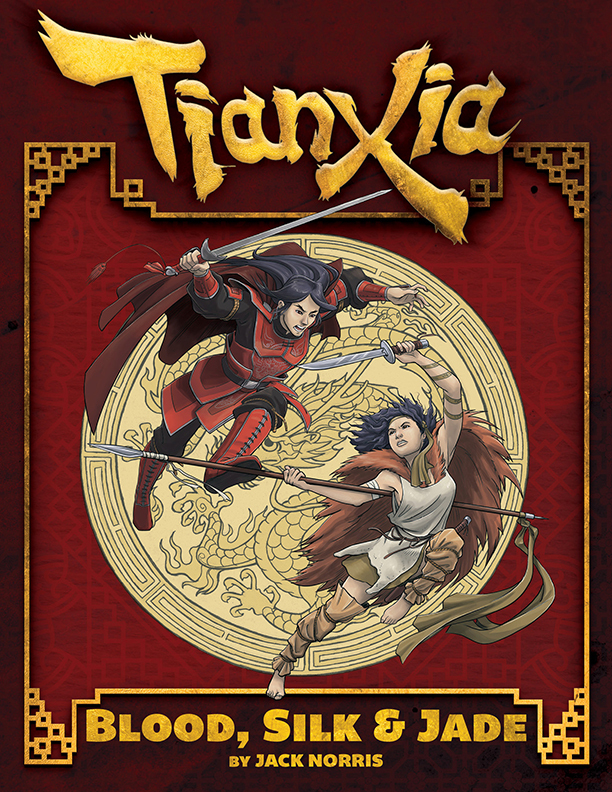 Tianxia: Blood, Silk and Jade is based on the Fate Core system, with a martial arts system layered on top. Since this system primarily uses aspects with free invocations, stunt-like techniques, an extra skill (Chi), and the optional Weapon and Armour ratings from Fate Core, it’s actually quite easy to handle for Fate veterans. The book is simply gorgeous, thanks to the gorgeous illustrations by Denise Jones and an attractive, legible layout. It may appear like a slim book at first (181 pages not counting the appendices and index), but that’s because it doesn’t have to spend much time on system since it does not repeat the Fate system basic rules. Since Fate Core is available on a pay-what-you-like basis from Evil Hat Productions, gamers are not saddled with an excessive cost. Author Jack Norris packed a lot of goodness in these pages, 36 kung fu styles, numerous locations and characters to use, story seeds, a random adventure menu, and good insight into the genre. The story seeds are open-ended, built exactly right to go with my philosophy of player-driven adventures: they offer a situation, some antagonists, and ideas for ways to embroil the heroes in the plot. Where they lead is up to your group, not a predetermined scenario. The characters are well-designed, and thanks to the stunt-like techniques, are relatively easy to play. Let’s not kid ourselves, martial arts games always require a little extra effort for the GM to familiarize herself in advance with the characters so she’s ready to rumble in the big fights, but thanks to the Fate system this is not too onerous. This has been the most satisfying wuxia system in my gaming experience, flexible enough that re-matches between opponents don’t generate the same fight every time (unlike games like, say, Weapons of the Gods where you always have the same optimal combination against a given opponent), lighter than Hero or the old Feng Shui, yet more structured than Wushu so each character has a specific flavour. In short, I absolutely love this book, and I’m really glad I was able to afford the hardback print version during the Kickstarter funding campaign. If you like wuxia games, this is the book for you, and I can’t wait for the planned supplements to come out. Note: Illustrations are copyright 2013 Vigilance Press and used with permission, except the Deck of Fate ad which is fair use and the dragon head photo which is Creative Commons, from Wikimedia. Posted on October 22, 2014 January 19, 2018 by mechanteanemonePosted in games, learning, Reviews, rpgsTagged actual play, BayArea, BigBadCon, conventions, fantasy, FATE, games, gm advice, how-to, martial arts, resources, reviews, rpgs, Tianxia, Vigilance Press, wuxia. Sounds like a fun game. Though some players actually don’t enjoy player driven games. You might like this article on video game designers looking at what people find fun. I found it quite eye opening as one of the people I game with is very discovery based, and all sorts of things made sense when I realized this.